Everything Just Sew: So close! Not that I get obsessed or anything, but it really is amazing how much you can achieve when you put in at least six hours a day on one project. (And your husband is on holiday to play with the twins!) Pricked fingers aside (don't like wearing a thimble) I have loved every single slow second of this project. And now I've finished seaming it. Maybe I'll just have to make another one in the smaller size, hehehe. I hadn't realised until I got into the project that the two layers would retain so much suppleness and flexibility - normally sewing two layers of fabric together like this (by machine) would make the resulting unit considerably stiffer, but this method doesn't - yippee! The layers give each other support and body, but the garment is soft and flexible. I'm really curious to see how it wears. Joy, my machine is a Globe 550, which I understand was marketed by but not made by Bernina. It has run like a dream since I talked my father into buying for me when I was 14. (That's 27 years) One model up from entry level it does everything I want (unless I get a really good machine that does embroidery, sigh.....) Oh yeah, and I have yet to teach it to make me coffee. Karen, I love the spirals on your top! I know exactly what you mean about enjoying the contemplative nature of this sort of sewing. (I'm probably hooked now.) And how something will go into your head as one thing and emerge as something else! Wow! That top was a labour of love. It's stunning! It is beautiful. Hope your Dad is still around to see the dividends his investment has paid. 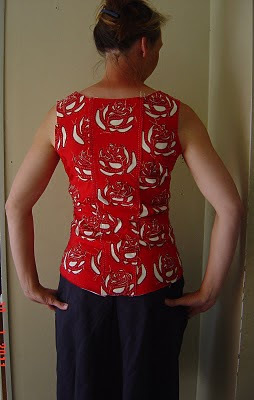 I've been waching the progress on this beutiful blouse. It is fabulous! So artistic. The best part though, was being interrupted for some little child love! How good is that?